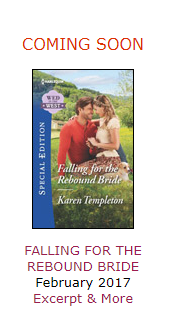 I’m thrilled to announce the release of the last two books in my Wed in the West series for Harlequin Special Edition! Set in my own backyard in beautiful northeastern New Mexico, where the Sangre de Christo mountains tower over majestic rolling plains and lush pine forests, we’re talking horses and cowboys, oh, yeah…as well my usual assortment of quirky characters, down home settings and rowdy little boys (and girls!). And dogs. I have loved writing this series, beginning with A MOTHER’S WISH in 2008, which went on to win a RITA award from Romance Writers of America…followed by another RITA for WELCOME HOME, COWBOY in 2011. But all good things must come to an end, in order to make room for other good things down the road. Following in February 2017 is FALLING FOR THE REBOUND BRIDE. When Deanna’s cousin Emily Weber seeks temporary refuge at the Vista after narrowly escaping marriage to her cheating fiancé, the peace she’s so desperately seeking is shattered by the strong, silent, and oh-so-tempting presence of prodigal son Colin Talbot, who’s unexpectedly returned home after many years away to deal with his own demons. Alone. But can these two shattered souls find solace in each other’s arms, at least until Colin leaves again? Or does fate have something entirely different in mind…? in other news, SANTA’S PLAYBOOK, which earned the rare 4.5 Top Pick GOLD designation from Romantic Times when it debuted in 2014, also went on to win RT’s Reviewer’s Choice Award for Best Special Edition for that year. Since I absolutely love this story, about a drama teacher whose biggest role turns out to be healing the hearts of a widowed football coach and his four children, I’m thrilled with how well received has been. And thanks to the wonderful world of digital publishing, this, as well as my entire backlist, is still available at Amazon.com, bn.com, another other etailers for years to come. It’s easy to see what I’m up to on my Karen Templeton Facebook page, where I post covers, blurbs, news and run frequent giveaways of both old and new titles as the mood strikes. So hop on over and “like” my page to join the fun! Need to get in touch otherwise? Just send me a note via the contact button here, and I’ll reply ASAP. Thanks for checking out my site, and my stories. I love my readers!